Rocky has been an iconic film series for the action genre and is considered as a launching pad for Sylvester Stallone’s storied career. As a tribute to its glory, the casino world has created an online slot that was themed after it. Rocky, which contains five reels and 25 paylines, is ideal for Stallone fans and everyone else who likes funs being integrated with action and excellent graphics. This online slot game comes with unique and brilliant features, each having its own perks and payout rates. Players can earn as much as 10,000 coins from this game with a minimum wager of only MYR 0.05! Knockout Bonus. This is triggered by the appearance of red boxing gloves on reels 1 and 5 simultaneously. In this round, Rocky will fight against an opponent in the ring (which can be Apollo Creed, Ivan Drago, or Clubber Lang) for 10 short rounds. For every round that he wins, players are awarded with a bet multiplier of X3. If Rocky knocks out his opponent before the 10th round, the subsequent rounds will all be automatically considered as wins. Therefore, players can win up to 30 times their stake. R-O-C-K-Y. 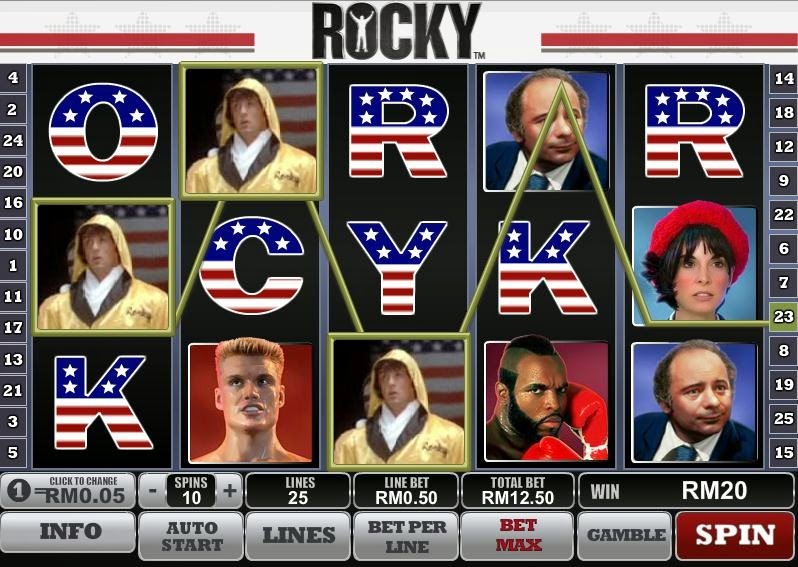 This feature allows players to win five times their stake if they are able to spell ROCKY in the five reels, which must read from left to right regardless of where the letters are positioned on each reel. This also activates the Free Spins bonus where players need to get three to five Italian Stallion Rocky scatter symbols to win as much as 25 free spins with X2 multiplier.